Need a cookie to make to take to a Christmas Cookie exchange party? Don’t have a lot of time or cookie baking skills? If you answered yes to either of these questions, then these iced sugar cookies are the cookies you should make as they are the easiest Christmas cookies I ever made. I love Christmas Cookies. Every December my friend, Karen has a cookie exchange – which is lots of fun. She decorates her house beautifully and always serves delicious munchies and her famous Bourbon Slush (yum). Many of my friends who I don’t get to see on a regular basis are always in attendance, so there is a lot of catching up to do, plus we all get to go home with a variety of cookies. Every year I try to make something different. I am always drawn to cut out cookies with details done in icing, but they take forever and mid-way through the process of gathering all the ingredients, making the batter, chilling in the refrigerator for a few hours, rolling out, then cutting with cookie cutters, I start to lose interest and I still have to bake, let cool, and decorate. At this juncture, slice and bake start looking pretty darn good. This year I knew I had to keep it simple, round and brown were in the back of my mind, but I knew they were not in true cookie party spirit. Inspiration came to me when I was shopping at AC Moore. I happened to go down the baking aisle and saw Wilton Cookie Icing. How cool, how easy, how inspiring! It is packaged just like Elmer’s Glue. I bought 2 bottles thinking it was worth a try. Usually royal icing dries out very fast and you have to apply it to the cookies using a piping bag, which I have never mastered. 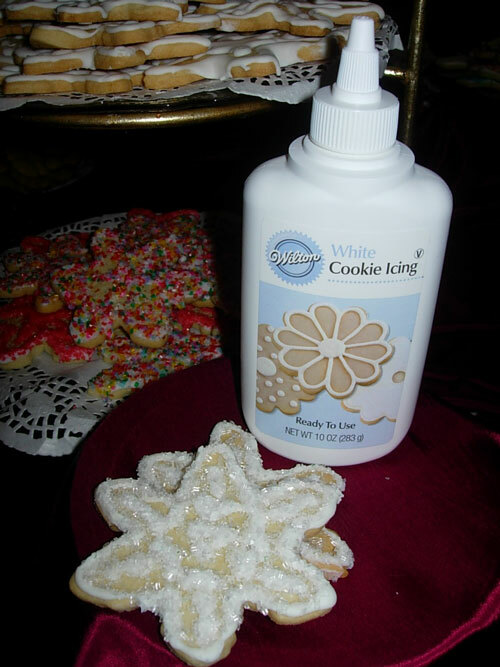 Since I am a crafter and have known how to squeeze a glue bottle since I was in kindergarten this literally seemed like the perfect way for me to create pretty cookies. This product is great, microwave it for 20 seconds and then decorate. Unlike royal icing, you can use it again- just twist the top closed when you are finished. I used this basic sugar cookie recipe, but you can use slice and bake and then ice them. When they were cooled I outlined each cookie and squeezed on some snowflake designs, then quickly sprinkled with sanding sugar. They looked so pretty, were delicious, and best of all, they were the easiest Christmas cookies I ever made. For more of my favorite delicious Christmas cookie recipes click the links here —-> Pecan Cherry Cookies; Chinese Almond Cookies. OK this is me quick simple and easy. Thanks for sharing.